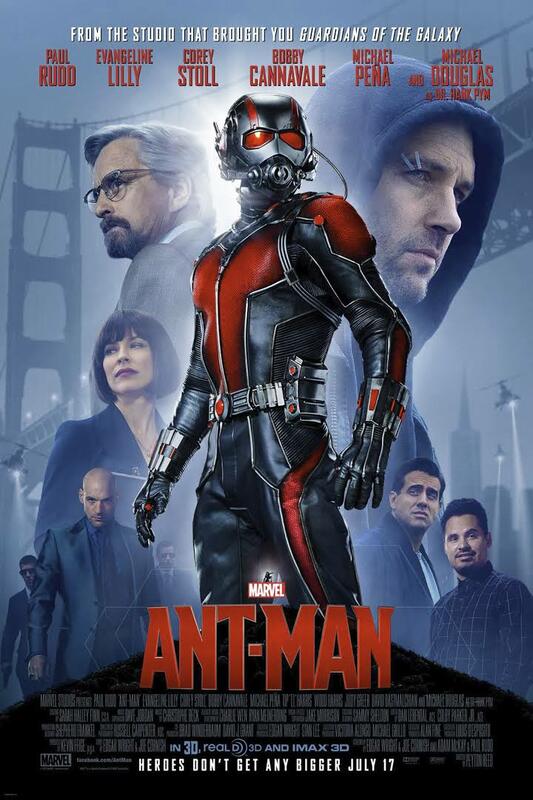 Ant-Man is now showing in cinemas everywhere and is distributed by Walt Disney Studios. For those who are not familiar with the wide world of Marvel comics, the concept of Ant-Man may seem like a reach of ridiculous measures to keep their successful superhero run of films flowing. However, with it's witty script and impressive special effects which give new life to a somewhat dated idea, Ant-Man is wildly entertaining and even comical while it breathes new life into a miniature hero on screen. When Scott Lang (Paul Rudd) is released from prison, the only thing he has on his mind is getting his life back on track and becoming a permanent figure in his daughter's life once again. The outside world is not so keen to have Scott back and his ex-wife, Maggie (Judy Greer) and her new fiancé, Paxton (Bobby Cannavale) are less than thrilled to see him back in the picture due to his history. Scott's friend and current roommate, Luis (Michael Pena) comes to him with a sure fire way to make some money, but it means retreating back to his old ways of cat-burgling and Scott reluctantly agrees as a last resort. Unexpectedly, this job results in coming into contact with Dr Hank Pym (Michael Douglas) and into a new profession for Scott as the superhero, Ant-Man, as well as giving Scott a whole new set of enemies to contest with. The concept of the shrinking man is one that has been seen many times in film at certain intervals over the years with The Incredible Shrinking Man (1957) and Honey, I Shrunk The Kids (1989) being two which immediately spring to mind. As a film, the idea of a man who can shrink on demand does seem to feel like the superhero genre is clutching at straws for new ideas. Yet Ant-Man made his first appearance in comics in 1962 and the film has been on Marvel's radar for over ten years so one cannot accuse Ant-Man of being a terrible excuse to make money by relying on a tried and tested concept. However, those who are familiar with the comics will find that there are many differences between the original Ant-Man and the film and there will inevitably be those who will scoff at the differences. The reasons for these changes are to create a more family orientated and friendly film and as a result Ant-Man has a point of difference in it's hilarious and well written dialogue and a wider audience which work in it's favour. Marvel fans will also rejoice in the references to other Marvel comics and productions, such as The Avengers. 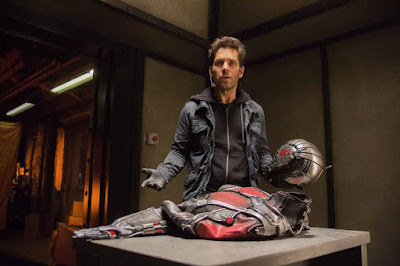 Ant-Man is not without it's flaws as the severity of the conflict is lost while the screenplay concentrates on making an entertaining dialogue driven film. The film certainly is entertaining and fun, but doesn't have a real sense of suspense, emotion or unpredictability as it's story is quite weak. Even though Edgar Wright dropped out of production in 2014, a great deal of what he worked on in the script remained for the final film and this is evident in much of the comical dialogue, as is co-writer and star of the film, Paul Rudd's sense of humour. Making Ant-Man in 2015 also gives it an edge over the films which it may be likened to with it's shrinking human aspect and this is because it allows use of the incredible CGI that is available for action films these days. The fast paced action sequences are very well done and create the thrill that the screenplay is missing. Ant-Man is one film that benefits from being viewed on the big screen as it enhances the difference in ratio between Ant-Man at his smallest. These scenes are well done and are even better on a bigger screen. Paul Rudd seems an unlikely superhero, but this perception works in his favour as his character of Scott Lang is much the same. His talent does not initially lie in defence and attack as much as it does his intuition and crafty abilities, but as the film progresses so does his reputation and believability as a superhero. Rudd also brings his likability which he is known for to the role and creates a character that people care about and want to see succeed. Michael Douglas gives hardly the performance of his career, but his charisma does indeed add something to his role of Dr. Hank Pym and to the film as a whole. His presence in the film is rather enjoyable and he plays his role well. While the good guys are great and have an incredible amount of character, Ant-Man does lack a really menacing villain which is crucial for a successful superhero film. Corey Stoll, who plays Darren Cross who creates Ant-Man's nemesis Yellowjacket, cannot be faulted as he does all he can with the role which is not created to be particularly strong. His "evil" mainly lies in personal conflict with Pym and although he does have his evil moments, the way in which his actions will effect man-kind do not create a sense of suspense or thrill. Despite Marvel's recent successful track record, Ant-Man still surprises in how much in it succeeds as an entertaining and enjoyable film. It's somewhat old-fashioned concept which is initially deemed worrisome is given a wonderful update with incredible special effects, it's witty and hilarious dialogue and a hero people enjoy to watch.